Step 6: Grab the partially finished ring tightly, and slip it off your mandrel. 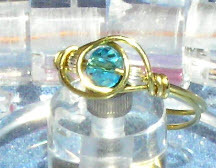 To keep your ring from coming apart as you finish it, put some painters and put some painters tape around each side of the beads to wire ring in place. 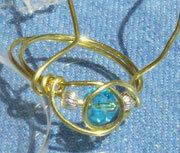 Step 7: Use your fingers to wrap the wire around each side of the ring tightly, winding 3 times around on each side. Step 8: Trim the wire using the flush cutters. Cut the wire flush to the inside of the ring. Having the cutting jaws close to the ring side. Step 9: At the cut end use your round nose pliers to make a small inside curve so that it can be tucked into the wire eliminating any snags or puncture capability. Tuck in the curved wire with your flat jaw pliers.